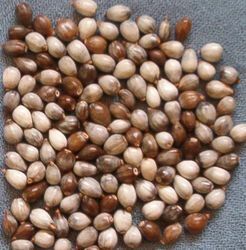 Description: Job's Tears in different natural colors, available at HiloBeads, http://www.hilobeads.com/natural_beads.html . Job's Tears that don't contain entirely white ones or entirely brown ones are $19/half pound, white/light gray ones and brown ones, when available, are $26/half pound, $14/quarter pound. There may be a waiting list due to some large orders.